Is Payroll Fraud Occurring at Your Company? | TMA Small Business Accounting, P.C., P.C.TMA Small Business Accounting, P.C. Payroll is often a company’s most significant expense. Unfortunately, theft within the payroll system can result if internal controls are not in place and steps are not taken to detect fraudulent activity in the company’s records. But there’s good news: Payroll fraud in all forms is largely preventable. 1. Eerily absent employees. “Ghost” employees receive regular paychecks, yet they don’t actually provide any services at a company. A ghost employee can be a real person who no longer works at the business but hasn’t been removed from the payroll records. It could also be a fictitious person who never worked there or an accomplice of an actual employee. Depending on whether or not a ghost employee is classified as hourly or salaried, timesheet approval may be needed prior to a paycheck being generated. Often, there is direct deposit of the check into a bank account set up by the thief. 2. Employees with too many hours yet too little time. An hourly employee’s compensation is determined by two factors: the employee’s hourly rate and the number of hours that they actually work. Hourly employees typically don’t have the access or the authority to change their hourly rate; therefore, the number of hours worked is the factor that is manipulated. Time worked is normally derived from a time clock, login and log off times in a computer, or a manual system compiled and approved by employees’ supervisors. Depending on the time tracking system in place, an employee, a supervisor or someone in the payroll department could change or approve the reported hours that were supposedly worked. The overstated time report is then submitted for payment, which is disbursed to the perpetrator. 3. Commissioned employees committing fraud. In many organizations, employees in the sales department are compensated based on the volume of sales they produce or the income that actually results from sales. In order to commit fraud, a commissioned employee must either exaggerate the level of sales generated or overstate the rate at which commissions are supposed to be paid. Without additional review and verification, the inflated sales and altered commissions are entered into the payroll system and disbursement of the fraudulent payment is triggered. Segregate duties. The preparation, distribution and reconciliation of payroll expenses should generally be segregated among different employees at your firm. If any of these duties are currently performed by the same employee, that individual likely knows about any weaknesses in the payroll system. Consider reassigning the duties to avoid the type of collusion that can facilitate fraudulent payments. Data mine payroll disbursement records. 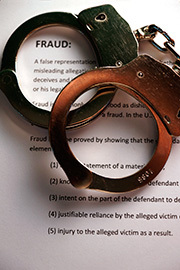 In order for payroll fraud to occur and someone to profit, the fraudster must receive a check. Consequently, company records usually contain the data needed to unravel fraud. For example, is there more than one employee with the same address? Does more than one employee deposit a paycheck in the same bank account? Forensic accountants analyze data including a check of payroll lists of employee addresses, start and termination dates, Social Security numbers and other factors. Ensure company policy compliance. Make sure to follow strict policies surrounding payroll. For example, are all new employees subjected to a background check? Are wage rates authorized by the designated officials in the company? Are sick leave, holidays and vacations approved and recorded appropriately in the payroll system? Do exception reports exist and are they reviewed regularly? Are payroll disbursement accounts routinely reconciled and all exceptions investigated by suitably trained professionals? Outsourcing payroll duties can also reduce losses. The evidence of payroll fraud is often hidden in plain sight because the transactions look legitimate. It can take a concerted effort to combat, but the results will be lower payroll costs and the comfort of knowing that your company is not paying employees who haven’t earned the money.